What is foresight concerned with, in its simplest definition? The graphic below summarizes it as Two Questions, each of which includes two goals, giving us a total of Four Goals (objectives, tasks, duties) of good foresight work. The Two Questions answer the “Why”, of foresight thinking and practice. They tell us why we must do it, as well as we can, as individuals, teams, organizations, and societies. What Could Harm or Disrupt Us? This question can be broken into two goals: Risk Assessment and Disruption Assessment. Risk is concerned with bad things that could happen, and Disruption is concerned with the big changes that are presently happening, with an emphasis on the potentially bad aspects of them, for us and others. How Do We Best Respond and Adapt? This question can also be broken into two goals: Opportunity Assessment and Adaptation Assessment. Opportunity is concerned with the potentially good strategies, innovations, and behaviors available to us, the best of which are most often, but not always, due to the disruptions occurring around us. Adaptation is concerned with deriving and executing Strategy that will make us successful, at least in our current environment, an evolutionary (local, contingent, short-term) strategy, and sometimes, in all the environments we can imagine ahead of us, a potentially developmental (universal) strategy. The Four Goals summarize the “What”of foresight thinking and practice. They tell us what the questions require us to pay attention to, as goals of our practice. The Four Goals of Foresight make an acronym, RODA, that we will refer to when helpful in the Guide. In US government practice, a Record of Decision or Agreement (RODA) is a public document that records a decision made by a governing body, or an agreement between public actors, that is relevant to the public interest. That is a convenient coincidence, as seeing RODA is the fundamental job of all foresight work, a job that is certainly in the public interest. We’ve already discussed System 1 and System 2 thinking. Notice now that Risk and Disruption are very strongly associated with System 1 thinking. Due to our evolutionary history, because until very recently we lived in an often hostile and lethal environment, most of us think of the downsides and dangers of change as our first, fastest, and strongest responses. This kind of thinking is led, at first, by our intuition and emotion. 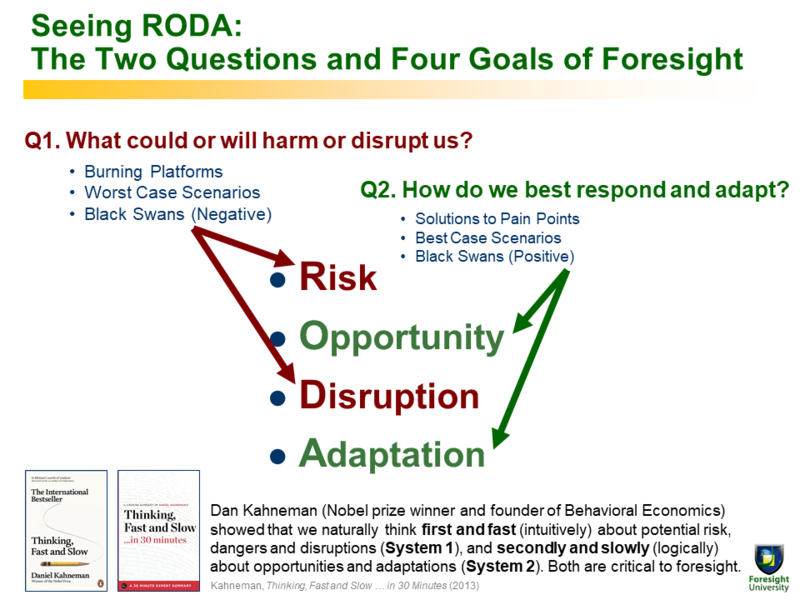 Notice next that Opportunity and Adaptation are very strongly associated with System 2 thinking. Because identifying opportunities and adaptive strategies usually require complex, sequential, and abstract thinking, these are our second, slower, and weaker mental responses. This kind of thinking is led, at first, by our logic and rational, evidence-seeking mind. As we’ll see in later in this chapter, in the work of Dilip Jeste, people who have an inclination to defensive pessimism, and folks are are protectors and predictors, have a useful inclination to go deeper in imagining to Risk and Disruption. People who are more inclined to strategic optimism, and folks who are experimenters and innovators, naturally gravitate to Opportunity and Adaptation. Both kinds of thinking, and both kinds of minds, are critical to good foresight production. Finally, notice that we’ve stacked the Four Goals in an alternating sequence, switching back and forth between System 1 and System 2 (defensive pessimism and strategic optimism), with each pair led by System 1, the first, fastest and emotionally strongest thinking type. We’ll see another alternating sequence later, when we describe the Four Skills of Foresight, as an alternating sequence of divergent, convergent, redivergent, and reconvergent practices of future thinking. Alternating sequences, cycles (the Do loop), and several other patterns we’ll see later (positive and negative feedback, thresholds, differentiation, integration) are processes we find in all living systems. We are in search of the most universal and biologically-based models of thinking, foresight, action, and adaptation we can offer you in this Guide.